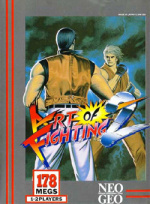 The original Art of Fighting may not have threatened Street Fighter II in terms of gameplay but it certainly turned a few heads and stole some of the trade away from Capcom’s seminal 2D fighter. This second game takes the core concept of the first title and gently refines several aspects to create a far more enjoyable (but sadly still not perfect) experience. Graphically Art of Fighting 2 is stunning; the original was no slouch in this department but the sequel heralded a new era of 2D opulence on the Neo Geo, effortlessly outclassing all other arcade titles in the process. The trademark ‘scaling’ effect is all present and correct, but this time round the backgrounds are more detailed and the characters themselves have a bit more charm about them. 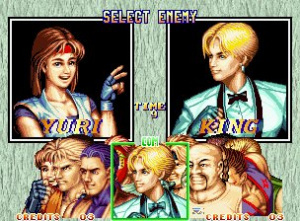 The majority of the original cast return, and you’ll be pleased to know that you can now play as any of them in single player mode (AoF restricted you to playing as Ryo or Robert unless you were participating in a two player bout). In terms of gameplay things are very much the same. It all feels pretty sluggish to being with, and each major attack is followed by intentional bouts of slowdown, as if to increase the dramatic impact of each fall. 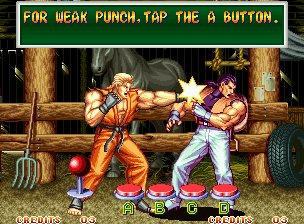 Punches and kicks are still assigned to just one button each, but this time holding down the button for longer results in a stronger attack. The final two buttons execute throws (or a strong attack if you’re not within grabbing range of your opponent) and the all-important taunt, which can be used to deplete your rival’s ‘spirit’ gauge. The gauge itself has become a bone of contention over the years. It’s also depleted as you perform special moves and once this empty robs your specials of any offensive power. It can only be refilled by ‘charging up’ but this takes time and often leaves you open to attack. Some fans insist this mechanic stops fights degenerating into cheap ‘fireball vs fireball’ affairs, but others find it incredibly annoying that with a few well-placed taunts your rival can reduce your spirit gauge and leave you totally at their mercy. It’s all down to personal taste, but the general consensus seems to be that most fighting fans dislike the system. Another issue that plagues AoF2 is difficulty. While we’re all for challenging games, it has to be said that AoF2 is one of the most frustrating 2D fighters we’ve ever experienced. Right from the opening bout the CPU is incredible adept at pulling off specials and putting together killer combinations. The less than fluid nature of the gameplay makes avoiding such attacks more difficult than it should be, and unless you’re willing to persevere and master the techniques of each fighter, things get annoying pretty swiftly. Although it’s a marked improvement over the first game, AoF2 still doesn’t quite manage to live up to its immense promise. Graphically the game is stunning and still manages to impress even by today’s standards, but the gameplay just isn’t engaging or intuitive enough to raise it to the level of a true classic. Having said that, if you’ve played and enjoyed the likes of Street Fighter II on the Virtual Console and hanker for something slightly different to keep you occupied, then this is worth looking into. 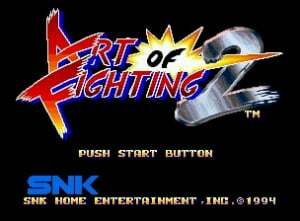 Hope we get Art of Fighting 3, it's one of the best Neo Geo fighters out there. but that's simply because of the 3's largely forgettable roster.